London’s Tate Modern was transported to a galaxy far, far away as a star studded audience attended the UK premier of the hotly anticipated new Star Wars film, Rogue One. 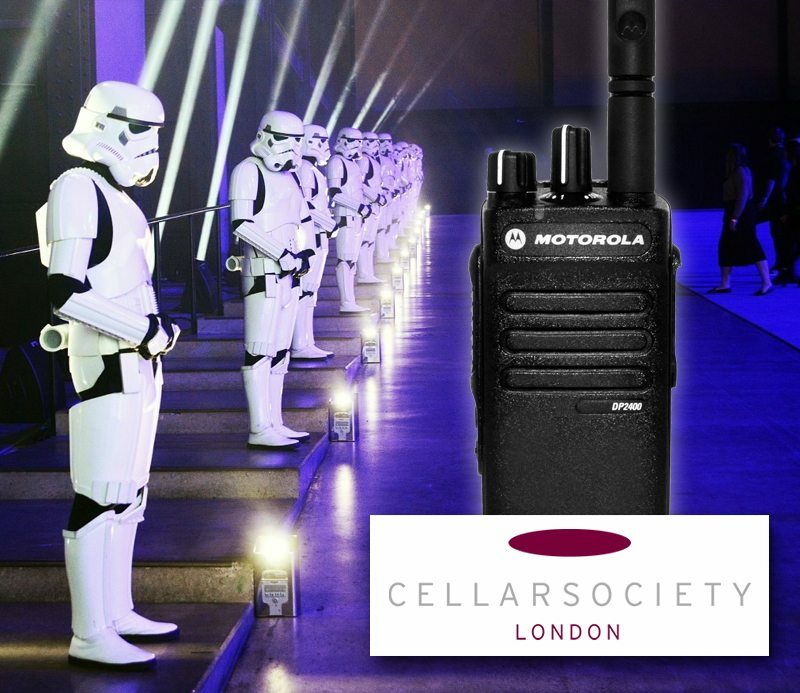 Brentwood was honoured to play a part in hosting the glittering event after we were hired by caterers to the stars Cellar Society to supply two way radio support. Having made a name providing catering services around London’s ultra-hip fashion scene, Cellar Society has become a go to brand for A-list parties and high profile celebrity events. It lists amongst its portfolio providing catering for Kate Moss’s wedding, where it built a 500-glass champagne tower filled with 360 bottles of Pol Roger. The Rogue One premier promised to be just as spectacular. With actors dressed as Stormtroopers patrolling the atmospheric Tate Modern, a departure from the usual home of UK Hollywood premiers in Leicester Square, the film’s stars Felicity Jones, Mads Mikkelsen and Forest Whitaker were all set to attend. Cellar Society was eager to keep up its reputation for delivering premium quality, meticulous organisation and a touch of flair to big events, and asked Brentwood to help ensure everything ran smoothly. The company hired a fleet of Motorola DP2400 digital radios for the event. With a large team of catering and waiting staff to coordinate and hundreds of guests to serve, the company’s prime requirement was to ensure everyone stayed in touch on what promised to be a whirlwind evening. The DP2400 is perfect for use in fast-paced, busy environments. Offering best in class digital audio and extended battery life, it is nonetheless a highly portable, unobtrusive handset to carry, with very straightforward and intuitive controls. Thanks to its digital technology, it also allows for easy switching between group and private calls, meaning there is less risk of confusion with lots of users trying to speak on busy channels at once. We supplied the radios with D Shape earpieces and soft leather carry cases and shoulder straps – one thing you need when you are waiting on a busy event is both hands free at all times, so this meant staff could listen in and carry the handset around while still keeping on top of the service. Finally, we supplied the two way radios on a JFMG (Joint Frequency Management Group) frequency, which provides exclusive use of those channels in a specific location for a temporary period. This ensured there was no risk of interference from rogue radio signals being used in the vicinity, and communication lines were kept crystal clear throughout the event. Want advice from the leading force in two way radio hire? With over 40 years experience, Brentwood Communications has supplied communications solutions to every type of event, big and small. Get in touch today on 01245 403520 for a free, friendly chat about your upcoming event.